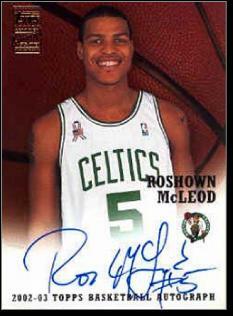 Roshown McLeod was born November 17, 1975 in Jersey City. A gifted athlete who cut his teeth against older boys on the playgrounds of JC, Roshown was over 6 feet tall when he entered St. Anthony’s in 1989, where he became a favorite pupil of legendary coach Bob Hurley. Roshown had a good mid-range jumper and the kind of court vision that always seem to make his teammates better. He was equally good at guard or forward, even as he grew to his final height of 6’8”. Not surprisingly, Roshown was heavily recruited. The winner was St. John’s coach Brian Mahoney, who had led the Red Storm to the NCAA Tournament in his first season at the helm. Unfortunately, Roshown never found the right fit in Mahoney’s offense, averaging under 10 points a game as a freshman and sophomore. Following the 1994–95 season, he decided to transfer. He would have done so a year earlier, but Coach Hurley advised him to stick it out. A solid student and good team player, Roshown decided that Duke was the smart move. Normally, the Blue Devils did not take transfers, but coach Mike Krzyzewski’s program had suffered it first losing season in over a decade and he was short on blue chip recruits. Duke had actually gone after Roshown at St. Anthony’s, so he was a known quantity. After sitting out the 1995–96 season per NCAA transfer rules, Roshown became a starter as a junior and the team’s go-to guy as a senior. He consistently scored in double-figures and became the veteran leader of a squad powered by four freshmen, including Elton Brand and Shane Battier The Blue Devils went 15–1 in ACC play and were ranked third in the nation headed into the NCAA Tournament. They lost in the regional final to Kentucky 86–84. The 76ers made a spectacular run to the NBA Finals that spring, but Roshown could only cheer on his Philadelphia teammates from the bench. His left knee just hurt too much to play. Roshown underwent off-season nerve surgery in the back of his knee, and was traded to the Celtics while rehabbing. He never got back to playing shape and, after several doctors told him the knee would never fully heal, he called it a career. Inspired by his own coaches—Bob Hurley, Coach K, Lenny WIlkens and Larry Brown—Roshown decided to get into coaching after leaving the Celtics. He joined the Fairfiled University staff as an assistant in 2002–03, was head coach of Woodward Academy in Atlanta, and spent two years as an assistant at Indiana before replacing Danny Hurley as the head coach at St. Benedict’s in Newark. Roshown left that job after the 2010–11 season, during which the team went 13–12. He decided to return to college coaching.